PlumWater Cottage: What is this? 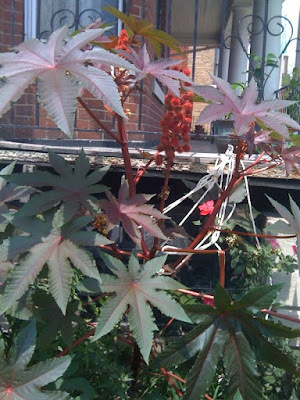 I believe it is the castor bean. Millie is correct. Don't eat the fruit/seed pod things. They are very toxic. Great plant otherwise. Wish they would overwinter in our Canadian climate. they are very dangerous to dogs! Hi, that is a caster bean plant. Very dangerous, toxic, even handeling the plant is toxic. The beans are large, shiny and attractive, and deadly. Ricis. I think that is how you spell it. The plant is a wonderful tropical looking thing, and can grow to be gigantic.Was used by old timers to kill gophers.A man in England was killed by a pellet that that been punched into his leg, spy stuff. They do use it for caster oil, but it takes complicated treatments to concoct. 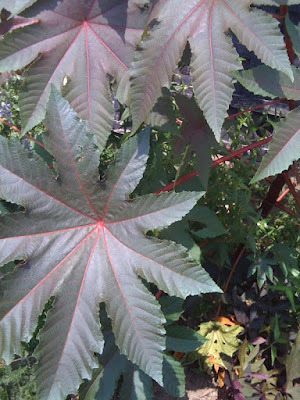 Yep, castor bean. And very poisonous.. one seed can kill a child. It is a cool looking plant.